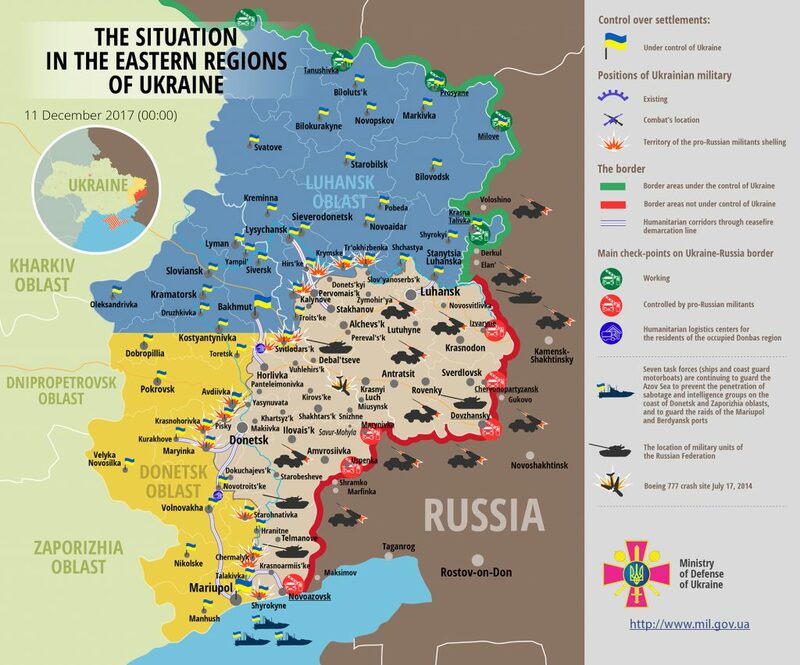 The situation remained tense in eastern Ukraine yesterday: Russian proxies violated the ceasefire 35 times. Alongside other types of weapons, militants used mortars of various calibers having fired over 130 rounds. Ukrainian troops returned fire 22 times using weapons not proscribed under the Minsk agreements, reported Ukrainian Ministry of Defense spokesman on ATO Oleksandr Motuzyanyk at a press briefing at Ukraine Crisis Media Center. In Luhansk sector, Russian proxies violated the ceasefire 20 times. Russia-backed militants mortared Ukrainian positions near Triokhizbenka after 17:00. “Ukrainian troops recorded ten explosions of 120-mm and 12 explosions of 82-mm rounds in course of the attack,” Colonel Motuzyanyk added. Militants mortared Ukrainian positions near Krymske three times after 19:00, and used mortars near Novotoshkivske and Travneve. “The enemy fired twenty 120-mm and twenty-five 82-mm mortar rounds,” added the spokesperson. At about midnight, militants made six random attacks involving 120-mm mortars near Zaitseve. In addition to mortars, Russian proxies used grenade launchers and small arms near Novooleksandrivka, Luhanske, Lozove, and Svitlodarsk. Ukrainian troops returned fire eight times. In Donetsk sector, Russia-backed militants made 15 attacks using 120-mm and 82-mm mortars alongside other types of weapons. In the morning, they fired ten 82-mm rounds near Chermalyk as well as in Pisky, Hnutove, and Shakhta Butovka areas. “The enemy used grenade launchers and small arms near Avdiivka, Maryinka, Pisky, Hnutove, Starohnativka, Shyrokyne, Kamianka, and Krasnohorivka,” Colonel Motuzyanyk added. Ukrainian troops returned fire responding to all the attacks. Two Ukrainian servicemen were wounded in action near Avdiivka yesterday, three more got concussion near Pisky and Lozove. “All servicemen were quickly evacuated to mobile military hospitals where they are getting all the necessary medical assistance,” the ATO spokesperson said. Report on the military developments as of December 10 is available here. Interactive data on the shelling: chronology shelling chart and the interactive map.